Though there are many free zip programs available for windows, one of the simplest and easiest to use is Bitser. 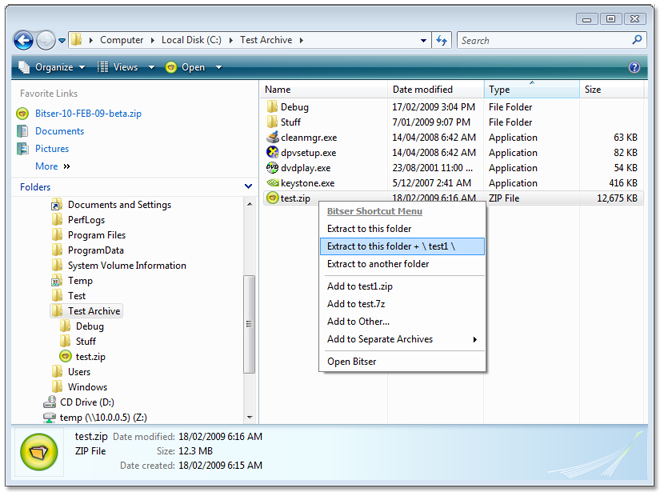 Bitser has been created as an alternative to the non-free zip programs WinZip and WinRAR. 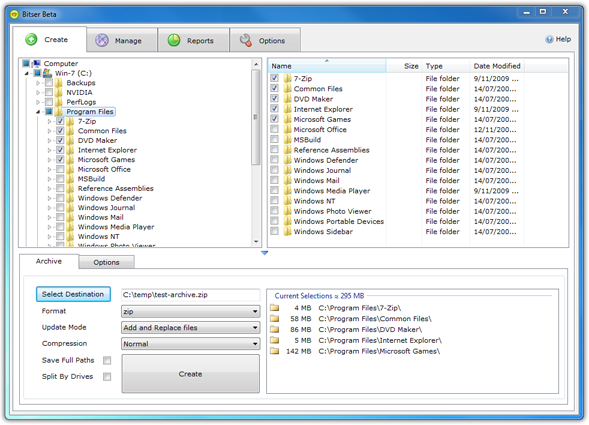 It has been designed to allow you to easily create or extract zip files using a Windows Explorer style interface which is familiar to most users. Here is a screenshot which shows Bitser's interface for creating zip files. There's a Windows explorer view of your files with checkboxes to select the files you wish to include in your zip file. As you check each item Bitser will calculate its size and display a running total of your current selections. To create a new zip file simply check the files and folders you want, select the destination directory and then click the create button to begin creating the zip file. There are a bunch of additional options available if you want to password protect or encrypt your zip file, split the file into multiple parts or increase the amount of compression applied. Bitser supports all of the most popular archive formats including ZIP, ZIPX, RAR, 7-ZIP, ISO, GZIP , BZIP, TAR, VHD and more. Bitser also lets you create your zip files directly from Windows explorer by right clicking the files and selecting Bitser from the context popup menu as shown in the screen below. Similarly, you can extract zip files directly in Windows explorer using the extract section of the menu. You can also extract or create multiple zip files at the same time by selecting multiple items and using Bitser's 'Extract all' and 'Add to separate' features. Bitser contains a number of these unique features that not all free zip programs provide. It has profiles that you can create and modify which allow you to save your settings and selections from one session to the next. It allows you to create self-extracting exe and multi-part zip files. It can convert archives from one format to another such as rar to zip. It can store passwords, calculate folder sizes, calculate file checksums, search for and delete empty folders and more. It also automatically detect whether your operating system is 32 or 64 bit upon installation and installs the appropriate version. To see a full list of Bitser's features click here. To see more screenshots click here or to see a YouTube video of Bitser in action click here. All in all, though there are many programs to choose from when it comes to free zip programs, Bitser stands apart in that its simple, easy to use, stable, contains no adware or malware and is completely free.